Enjoy modern Middle Eastern fare in the heart of North Freo. We want that green wall, we want their aprons, we want the glassware, we want the shipping container. Okay, we just want to live and breathe Propeller. 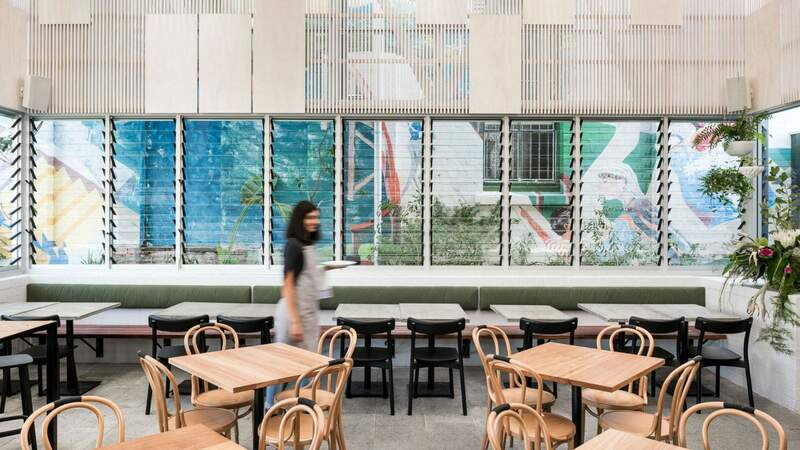 Located in North Freo, this all-day contemporary eatery lends itself to all manner of social engagement — from a quick take-away coffee and pastry to booze-filled Sunday brunch on the outdoor terrace with friends. Open from 8am till late (for breakfast, lunch and dinner) Propeller has you well and truly covered. Chef Kurt Sampson utilises the best local produce to create seriously moreish share-style fare inspired by flavours of the Middle East. We suggest you treat your taste buds to the tasting menu. Reasonably priced at $49 per person, it gives you the chance to sample a few different dishes chosen by the chef. The wine list boasts both local and international drops, as well as a strong selection of craft beers. Spin into Propeller for a feast from the Middle East you'll never forget.